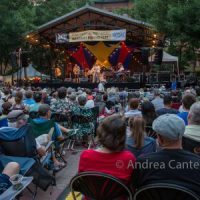 The 2018 Montreal Jazz Festival – A Whole World of Music! 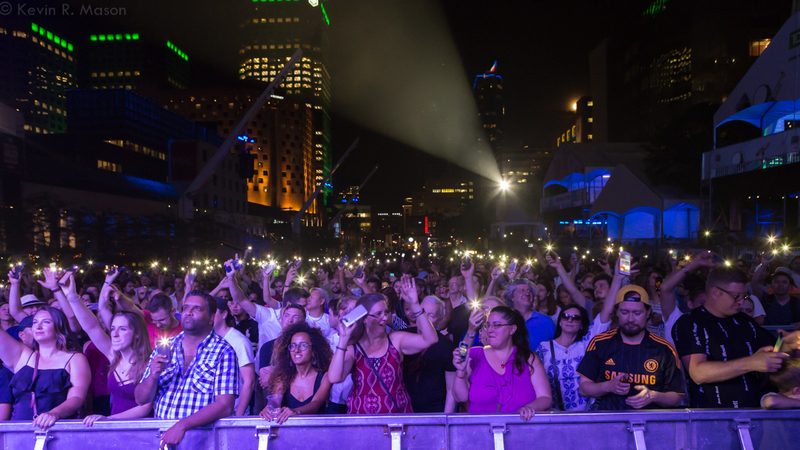 The 2018 Montreal Jazz Festival, officially called Le Festival International de Jazz de Montréal (FIJM), took place from June 28 to July 7. The word “International” in the title is particularly appropriate, since it’s a truly global event, with performers from Haiti, New Zealand, Brazil, Israel, Cape Verde, West Africa, the United States, France, Italy, Scotland, Spain, Jamaica, Norway, the United Kingdom, Guadalupe, Belgium, and Ontario, just to name some of the places. Opening Act: Christian Sands Trio. 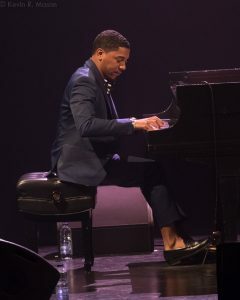 Accomplished young pianist Christian Sands started the show in great form with Jonathan Barber on drums, and Eric Wheeler on bass. All three were dressed to the nines, and their music sounded as good as they looked. They began with “Humpty Dumpty,” a dreamy number by Chick Corea. Next came Cedar Walton’s “Bolivia,” a percussive, upbeat piece. The trio played their hearts out, with some special pyrotechnics from drummer Jonathan Barber. Sands said that they’ve been on tour, and they’ve been particularly looking forward to coming to Montréal, because it is such a great festival, with great people, and wonderful food. Their third song was one of Christian Sands’ own compositions, “Reaching For The Sun” and it was lovely and romantic. 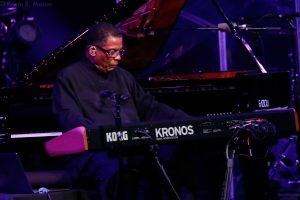 Christian joked that after playing songs by Chick Corea and Cedar Walton, he wanted to do one of his own, “Because I need some money, too!” For the last song, Sands played a guessing game with the audience. “I won’t tell you what it is, but I think you’ll recognize it.” It turned out to be “I’ve Got Rhythm,” played at a rapid pace, with a lot of verve, especially from Christian on the piano. They received a much-deserved standing ovation, because it was really an outstanding start, on the first day of the Festival. 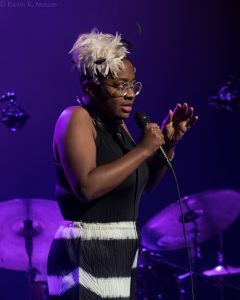 Cécile McLorin Salvant came on stage wearing a striking black and white outfit, with a feathered fascinator on her head. The Christian Sands Trio set the bar very high, and Cécile kept it there. The woman is a born storyteller, and she has a great way with lyrics, as well as an exceptional singing voice. With Adam Birnbaum on piano, Paul Sikivie on bass, and Kyle Poole on drums, Salvant did a great rendition of “I Didn’t Know What Time It Was.” She followed with “Darkies Never Dream,” acknowledging that the song had a “problematic” title, singing the sad lament with conviction. “I’m All Smiles” was a real change of pace, a charming ode to love. “Sam Jones’ Blues” was witty and fun, and “Wives and Lovers” was a song that Cécile sweetly conveyed. Then she performed a sprightly, entertaining version of “Stepsister’s Lament” from Cinderella. “And I Love Him” was beautifully plaintiff and extolled the virtues of a lover. She changed it up again with the humorous, “Never Will I Marry.” She also sang a couple of songs in French, and spoke fluent French throughout the show, much to the enjoyment of the crowd at Theater Masionneuve. For an encore, Cécile sang an affecting fable, a cappella, about two ill-fated lovers. If anyone could follow Christian Sands, it was certainly Cécile McLorin Salvant, in a memorable performance. Opening Act: Davina and The Vagabonds. 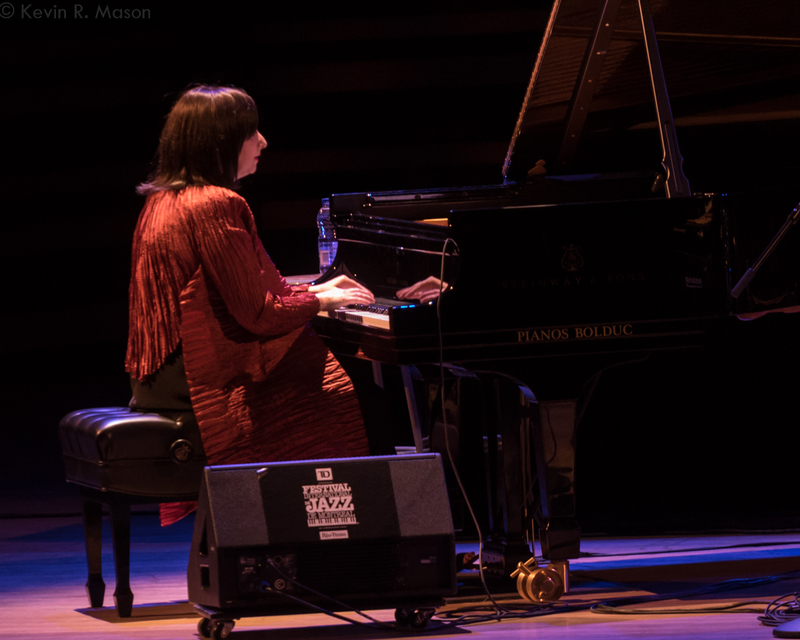 Lead vocalist/pianist Davina Lozier of Davina and The Vagabonds said that FIJM was on her bucket list, because it’s one of the major festivals in the world. 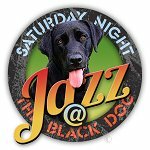 She started with Louis Jordan’s “Knock Me a Kiss,” with bassist Brian Padavic, Zack Lozier on trumpet and vocals, Steve Rogness on trombone and vocals, and Andrew Gillespie on drums. The show continued with “Pocket,” a hot original song that showed off Davina’s big voice, big personality, and on-stage charisma. 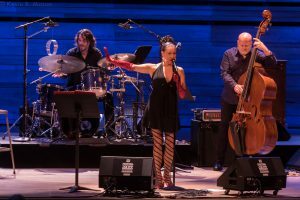 The group’s New Orleans-style jazz included “Ain’t That a Shame,” “You Gotta Shake That Thing,” and a hilarious back-and-forth duet/duel between Davina and trombonist Steve Rogness. The set ended with a rousing “St. James Infirmary” that got the audience members to their feet, and almost blew the roof off the building! Dee Dee Bridgewater’s band, guitarist Charlton Johnson, background vocalists Skyler Jordan and Monet Owens, aka “Brown Sugar,” saxophonist Bryant Lockhart, drummer Carlos Sargent, trumpeter Curtis Pulliam, and keyboardist Dell Smith started their set with a lively “Soulfinger,” then Dee Dee came on stage in a striking leopard-print dress, stiletto heels, and long feathered earrings. She said, “I’m so glad to be back. 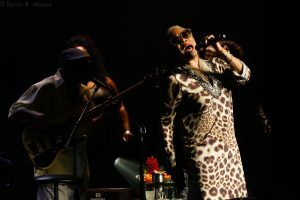 I started at the Festival on this stage, and now I’m back.” The songs in this concert were from her newest CD, Memphis…Yes I’m Ready, music she first heard on the radio as a teenager in Memphis, Tennessee. She said that it’s largely forgotten how important Memphis was to soul music, and how much great music came out of the city. She passionately sang “Giving Up,” which she first heard Glady Knight and the Pips sing, then followed with the Al Green/The Temptations song “I Can’t Get Next to You,” which she performed with an abundance of sensuality. Bridgewater spoke of the night she heard a song on WDIA Radio that really touched to her, Barbara Mason’s “Yes I’m Ready,” and she felt like the song had been written just for her. She performed it with such feeling, it obviously still means a lot to her. She reminisced about singer Carla Thomas, who used to babysit her, and honored her on the CD with one of Carla’s biggest hits, “Baby.” Dee Dee said recording this CD helped to lift her spirits from the sorrow of losing her mother. She talked about her 90-year-old father, Matthew Garrett, who taught many jazz musicians, including NEA Jazz Master Charles Lloyd. Bridgewater had a long friendship with B.B. King, and sang a stirring, “The Thrill Is Gone.” The band did Wilson Pickett’s version of “Don’t Be Cruel” and Tina Turner’s “I Can’t Stand the Rain.” On Otis Redding’s “Try a Little Tenderness,” Dee Dee revealed the surprising fact that it had been a hit for Bing Crosby in the 1930s. Bridgewater joked about knocking herself out to impress the audience, trying to redefine what a woman in her 60s is. With the energy and looks of someone years younger, she’s a fine role model. When someone called out, “China,” it led to an impromptu version of “On a Slow Boat to China.” Bridgewater closed with an emotional “Purple Rain,” which was dedicated to anyone who had lost a loved one. It was a beautiful denouement to a fantastic set. Opening Act: Gentiane MG Trio. Pianist Gentiane MG, bassist Levi Dover, and drummer Louis-Vincent Hamel played an evocative and atmospheric set, the kind of music that’s perfect for a rainy Sunday indoors, a winter’s evening, or after any stressful day when you need a balm for the spirit. 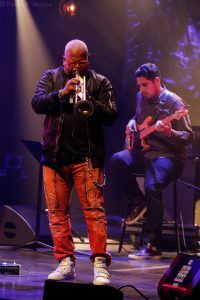 With songs that included “Fool’s Gold,” “Road to Nowhere,” and “Comeback,” it was a perfect opener for Terence Blanchard. Trumpeter Terence Blanchard’s set started with a recording of Terence talking about his inspirations, and the importance of finding one’s musical voice. Blanchard and his musical compatriots really brought their “A” game, with Taylor Eigsti on keyboards, bassist Josh Hari, drummer Oscar Seaton, and guitarist Matt Sewell. The concert covered funk influences, straight-ahead jazz, and some edgy experimental sounds in an enjoyable mix that included “Live,” “Hannibal,” “Chaos,” “Soldier,” “Unchanged,” and “Jimi,” a tribute to Jimi Hendrix. The encore was the theme from the Don Cheadle film, Talk to Me, and that film is how the E-Collective first got together. Blanchard did soulful double-duty on a keyboard, finishing a show that more than lived up to the audience’s expectations. Opening Act: Thundercat. 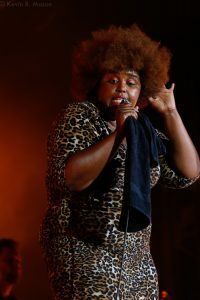 Singer/bass guitarist Thundercat came out dressed in an eclectic outfit of printed orange shorts and a black-and-white striped shirt. He jumped right into a set filled with several genres, and he often sung in a stunning falsetto. With keyboardist Dennis Hamm and drummer Justin Brown, Thundercat’s high-energy show was a real crowd-pleaser. Herbie Hancock came on stage and wished the crowd a belated Canada Day, which was the previous day. He began a song he described as part of a journey, and advised the crowd that it would start out kind of scary, “So fasten your seat belts!” Bass guitarist James Genus, singer/guitarist Lionel Loueke, and drummer Trevor Lawrence gave magnificent support in a show that included “Actual Proof.” Hancock’s captivating keyboard solos on his synthesizer, delivered an awe-inspiring performance that demonstrated that he hasn’t lost one step. Hancock and company had the crowd in the palm of their hands, from start to finish, each adding their own unique talents to a special set. Singer/guitarist Ben Harper has a long history at FIJM, first appearing in 1994. At a press conference on the day before his concert, he called it, “The most special festival in the world. I’ve never seen another festival transform a city like this!” Harper received the Ella Fitzgerald Award, given to “a jazz singer of significant talent who has had a major impact and influence on the international scene.” He said, “I hope to work a lifetime to deserve an award like this.” He told anecdotes about his career and was particularly attentive and thoughtful when answering questions. 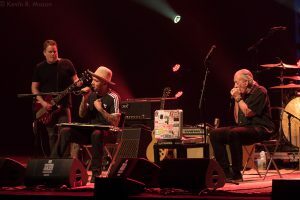 The next evening, Alain Simard, co-founder of the Festival, once again presented Ben Harper with the Ella Fitzgerald Award, so the packed audience at Salle Wilfrid-Pelletier could witness the honor. Ben said that he and Ella both loved collaborating with other artists, they both have lived in Los Angeles, and he quipped that they were also both married three times! On a more serious note, he said, “Ella Fitzgerald had one of the greatest voices of the 20th century. I’ve never been more privileged to receive an award. Thank you.” The concert started with an emotionally charged “Summertime,” that Ben began as a solo, riveting the audience. Harper was joined by drummer Jimmy Paxson, guitarist Jason Mozersky, bassist Jesse Ingalls, and the legendary Charlie Musselwhite on harmonica and vocals. The concert continued with “When I Go,” a minor-key classic, and “Bad Habits,” a blues-infused honky-tonk number. 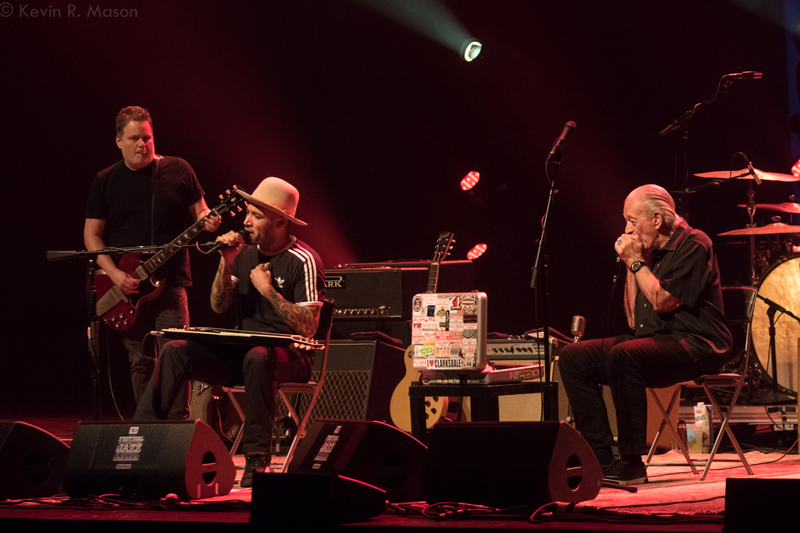 Charlie Musselwhite not only showed off his extensive harmonica skills, but also his powerful voice. “I Don’t Believe a Word You Say,” was dedicated to Donald Trump, which elicited a roar of approval from the crowd. Ben did a stellar tribute to the tambourine, which he focused on as a child in church. The group performed “I’m In, I’m Out, And I’m Gone,” and on “I Trust You to Dig My Grave,” Ben and Charlie showed how a guitar and harmonica alone on stage can produce such a full sound that it fills a packed venue. There were three encores, including “No Mercy In This Land,” from the Harper-Musselwhite CD of the same name. Another encore featured Charlie in all his glory, and Ben chimed in with some moving vocals. 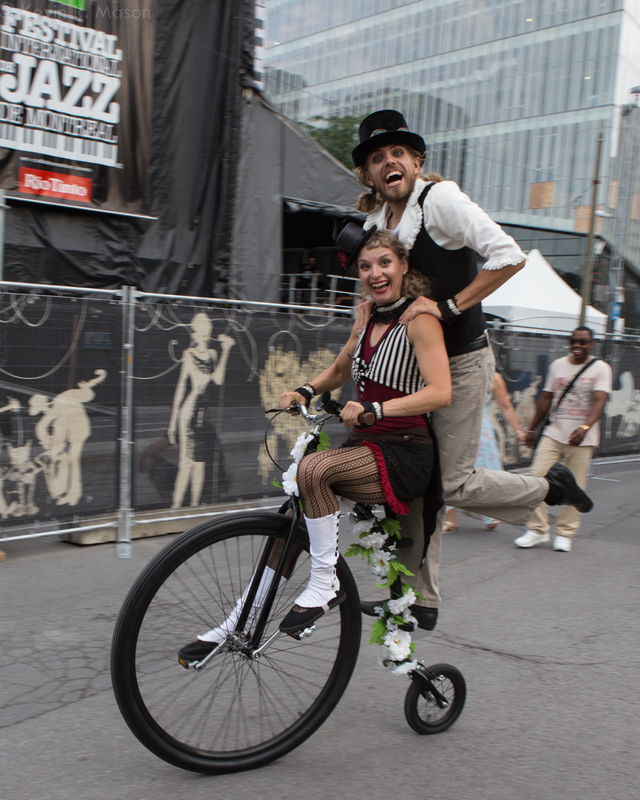 There were many highlights of the FIJM, and this was one of them. Opening Act: Renee Rosnes. Pianist Renee Rosnes was the opening act, and the evening started with Renee receiving the Oscar Peterson Award, which according to the Festival program, was created in 1989 to recognize “a performer’s musicianship and exceptional contribution to the development of Canadian jazz.” Renee said, “He (Oscar Peterson) was one of the first people I ever heard play jazz, and he was an integral reason why I wanted to become a jazz pianist.” Ms. Rosnes was joined by drummer Lennie White, bassist Robert Hurst, and vibraphonist Steve Nelson on a set that included “Elephant Dust,” “Lucy From Afar,” “Galapagos,” and “From Here to a Star.” Renee displayed the skills that won her the Oscar Peterson Award, and she was wonderfully supported by her band. Steve Nelson’s vibraphone work added a fantasy element to much of the show. This set captured a lot of moods, and it was greatly appreciated by the audience at Maison Symphonique. Before the second half, André Ménard presented tabla player Zakir Hussain with the Antônio Carlos-Jobim Award, which honors artists who are distinguished in the performance of world music, and who have had a profound effect on the evolution of jazz. Zakir said, “I don’t deserve this award. I have been carried on the wings of many great musicians who helped to mold and mentor me.” The audience experienced the music of three masters with bassist Dave Holland, Zakir Hussain on tabla, and saxophonist Chris Potter. The show included a tribute to guitarist John McLaughlin by Zakir, and “Good Hope,” a bright, melodic song composed by Chris Potter, which transported the crowd to a jazz paradise. One of the best things was how each performer got a chance to shine. The encore, after a thunderous ovation, was a thing of beauty. Zakir played his face like a drum at one point, which amused the audience! 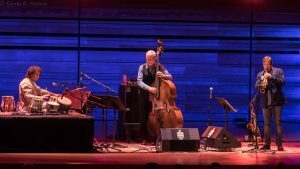 Marc Ribot – Songs of Resistance. 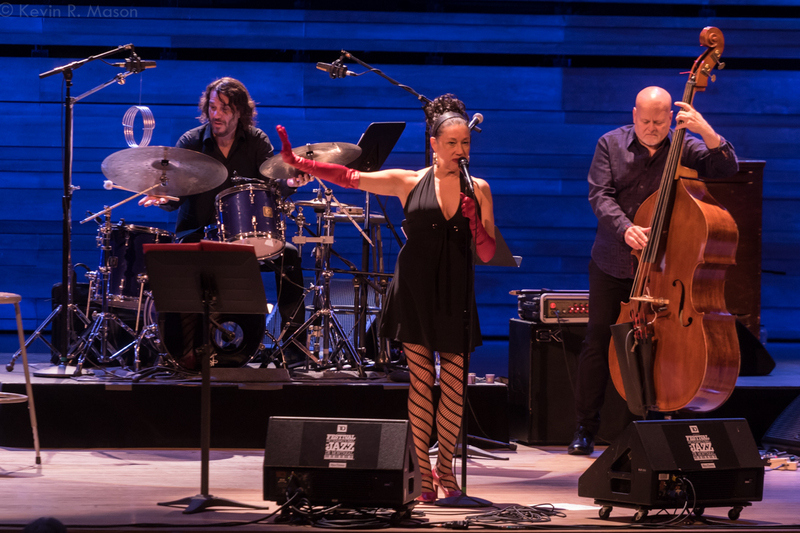 The group, guitarist Marc Ribot, bassist Bradley Jones, and drummer Reinaldo De Jesus, started with a civil-rights-era song that was often performed when people got arrested. “We Are Soldiers in the Army” was dedicated to those who were protesting the immigration crisis in the United States that very day, with some getting arrested. 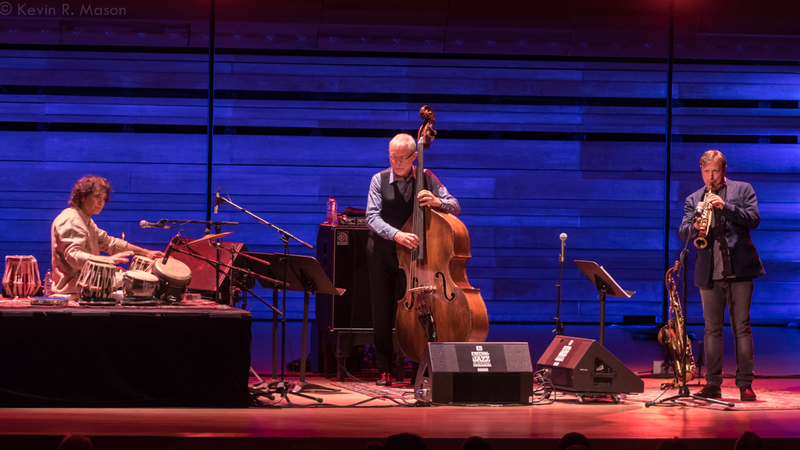 The concert was filled with songs that were a mixture of spoken word and singing by Marc Ribot. The timely show was an emotional reminder of the importance of dissent in troubled times. Ribot discussed having initial reservations about recording these songs, and how he was concerned about alienating some of his audience. In the end, he decided it was more important to speak truth to power. The Suffers. On one of the hottest nights in a week-long heat wave, at the outdoor TD Stage, The Suffers provided music as scorching as the temperature. Lead singer Kamerra Franklin thanked everyone for coming. This was their first visit to Montreal, and she said it was a wonderful experience. She discussed the group members all quitting their day jobs in 2015, without knowing what would happen. That gamble turned out to be a blessing for the group, and for the crowd who got to enjoy this talented ensemble. Kamerra has a big voice, singing like she was born to be on stage, and the band matched her note for note. The final song was “Shout,” and it was smashing show! Gilad Hekselman Trio with Mark Turner. 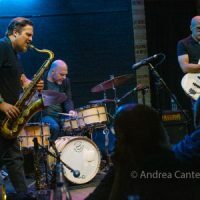 Guitarist Gilad Hekselman collaborated with drummer Jonathan Vincent, bassist Rick Rosato, and guest star, saxophonist Mark Turner. Gilad welcomed the crowd, and said, “Music is a good thing to celebrate. 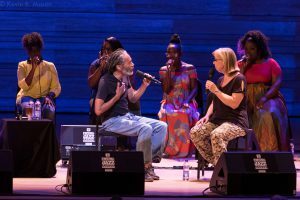 When everything seems like it’s in a weird place, we still have music.” The concert was a beautifully intimate set, and included “It Will Get Better,” which Gilad composed for his son. 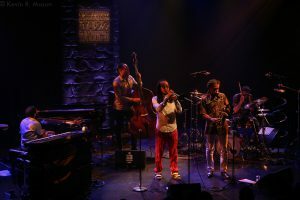 The performance continued with “Stumble,” which was inspired by a Wayne Shorter song, and “Clap Clap.” This was one of the small gems of the Festival. Theo Croker. 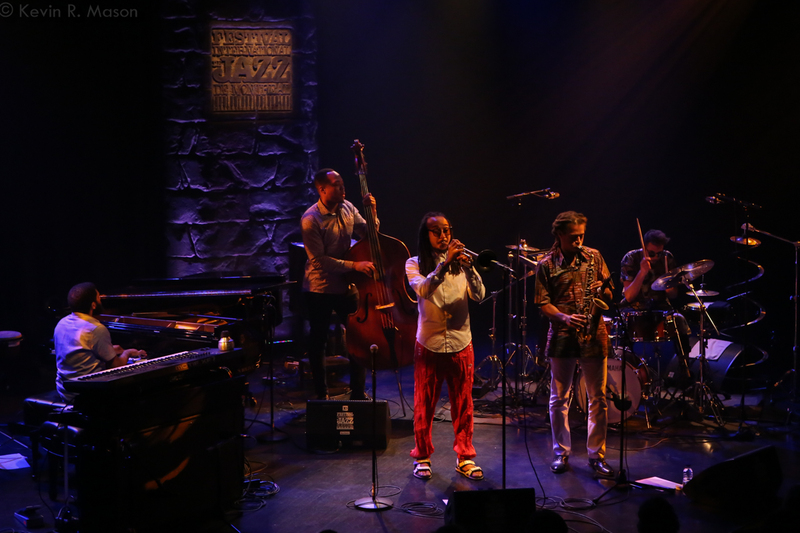 Brilliant trumpeter Theo Croker’s set began with “Crestfallen,” featuring exciting solo work by saxophonist Irwin Hall, pianist Mike King, drummer Kassa Overall, and Croker. The exceptional musicianship from the ensemble kept the audience engaged throughout. 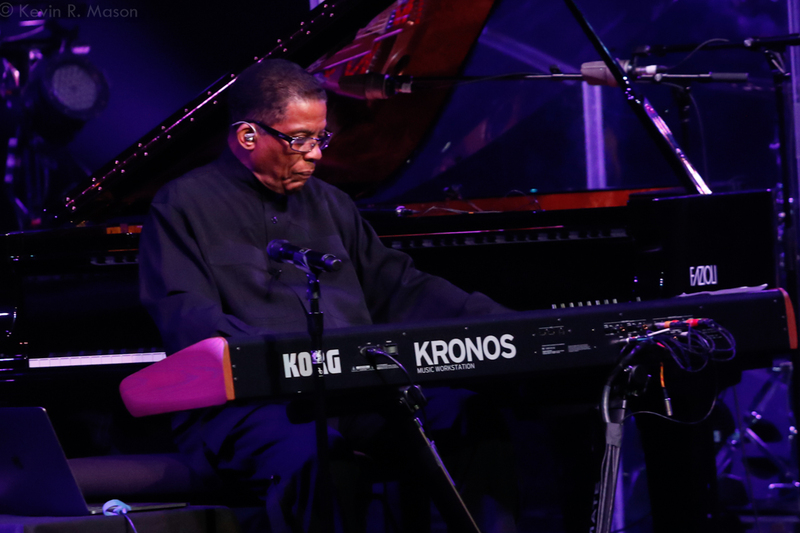 Theo said, “This is our second time here, and we were happy to be invited back.” The set list included “No Escape from Bliss,” “To Wisdom the Prize,” “Real Episode,” and ‘The Messenger,” a tribute to the Muslim contribution to jazz from musicians like Yusef Lateef and Ahmad Jamal. David Binney’s Alhambra Trio Featuring Logan Kane & Nate Wood. 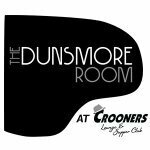 Saxophonist David Binney was backed by bassist Logan Kane, drummer Nate Wood, and guest pianist Luca Mendoza. They played an interesting, intense, and edgy set that included “San Francisco” and “La Casa.” Saxophonist Chris Potter sat in on one song, adding his stellar virtuoso skills to a beautiful concert. Benny Golson with the Emmet Cohen Trio. 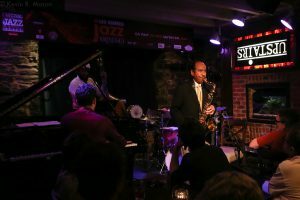 Legendary saxophonist Benny Golson thoroughly entertained the packed Upstairs club with fascinating anecdotes and his smooth sax accents. He spoke of a 1956 gig with Dizzy Gillespie at Harlem’s Apollo Theater, and a nearby bar called the Oasis that the band visited between sets. They were laughing at pianist Walter Davis Jr., who was flailing his arms and walking oddly as he returned from the Oasis, and initially thought he had too much wine. Soon, they realized he was crying as he told them trumpeter Clifford Brown had died in an auto accident. 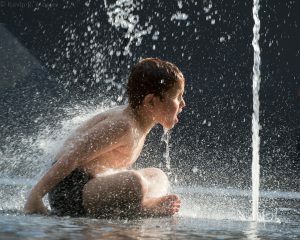 This inspired Golson to write “I Remember Clifford,” and it has since been recorded over 500 times. Golson and the trio of pianist Emmet Cohen, bassist Russell Hall, and drummer Evan Sherman performed the tune for the Upstairs crowd, and Golson said Cohen’s meticulous articulation on piano reminds him of Clifford Brown’s trumpet skills. Like Clifford, Golson revealed he never knows what Emmet’s going to do, but he does it so beautifully! Dr. Lonnie Smith Evolution. 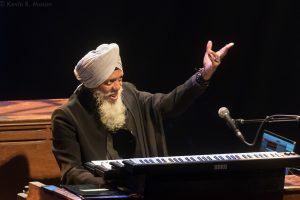 Hammond B3 organ player extraordinaire Dr. Lonnie Smith participated in the TD Invitational Series. 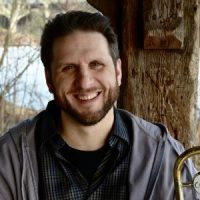 In this concert, he was joined by excellent musicians, including saxophonists John Ellis and Jason Marshall, guitarist Jonathan Kreisberg, trombonist Robin Eubanks, and guest vocalist Alicia Olatuja. The set’s first song was a swinging “Falling In Love.” The group had a full-bodied, big-band sound, and the musicians were really in the zone, communicating with ease on songs like “Too Darn Hot.” Alicia Olatuja added exquisite vocals to “All in My Mind,” which was a passionate duet with Smith. “I Didn’t Know What Time it Was” started with a haunting intro and segued into a driving, percussive beat. Alicia returned for “Pilgrimage,” a beautiful ballad about a journey. 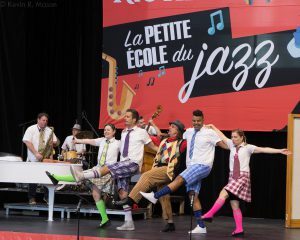 This charming, bilingual show, one of FIJM’s longest-running attractions, was packed at twice-daily performances. They used a variety of musical styles, especially jazz, to introduce young audiences to the jazz genre in a fun, interactive way. 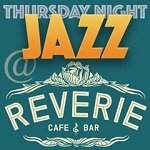 Featuring Les Zélèves, a vocal harmony quintet led by Victor-Jacques Menard, and the James Gelfand Quartet. 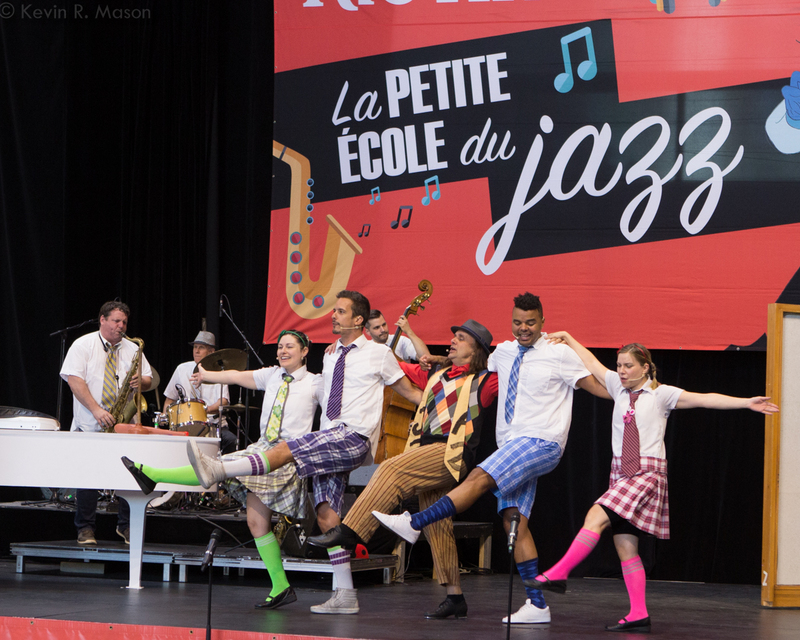 They taught lessons through skits, dance, and songs, including “Take Five,” “Frere Jacques,” “Twist and Shout,” “We Will Rock You,” and some jazzed-up classical music standards. Beloved blue Festival mascot Ste-Cat arrived, and the group performed “Cheek to Cheek,” “When Sunny Gets Blue,” “I Got Rhythm,” “Take the ‘A’ Train,” “Cherokee,” and “What a Wonderful World.” At every show, diplomas were given to each child, in French on one side and English on the other, and Ste-Cat’s paw print. 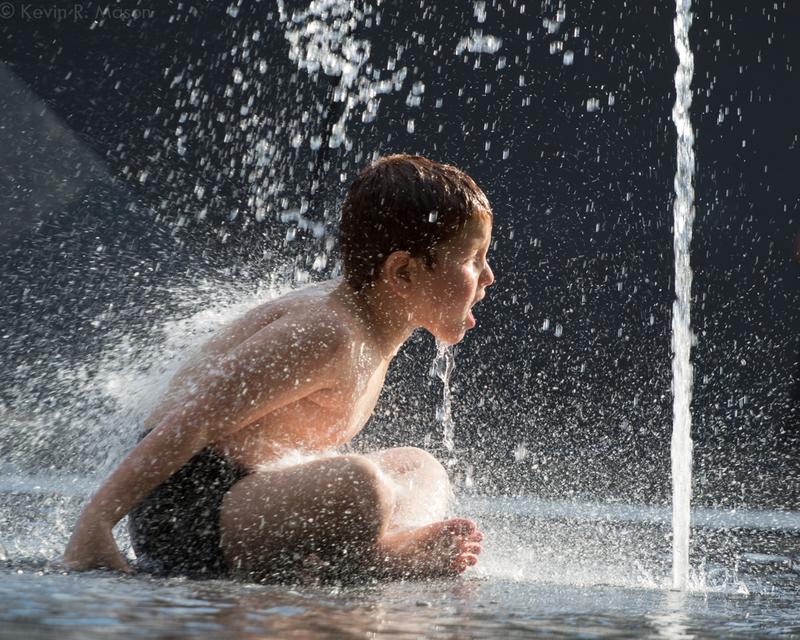 FIJM has many family-friendly activities, and this is one of the best! 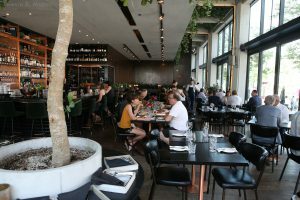 Owned by the Festival, The Blumenthal Montréal is a beautiful restaurant housed in Maison du Festival (the official residence of FIJM), and the profits go to support the free activities at the Festival. Open seven days a week, with a delicious, fresh, and innovative menu, it is the perfect place for brunch, lunch, dinner, or late-night cocktails. You can enjoy your meal in the gorgeous inside atmosphere, or feast on the lovely outdoor terrace. Whether you’re in town for the Festival, or any time of the year, The Blumenthal should be on your to-do list. 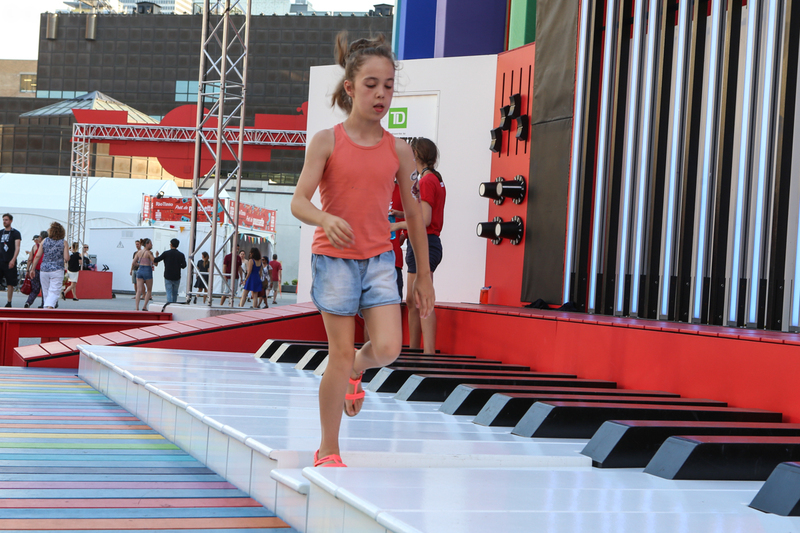 “In 2019, the Festival International de Jazz de Montréal, presented by TD Bank Group in collaboration with Rio Tinto, will celebrate its 40th birthday with a grand gesture for the benefit of Montréalers, Montréal and its neighbourhoods. The Festival will show its leadership with an ambitious development plan allowing it to expand its footprint all over the city, and reach out to citizenry everywhere. 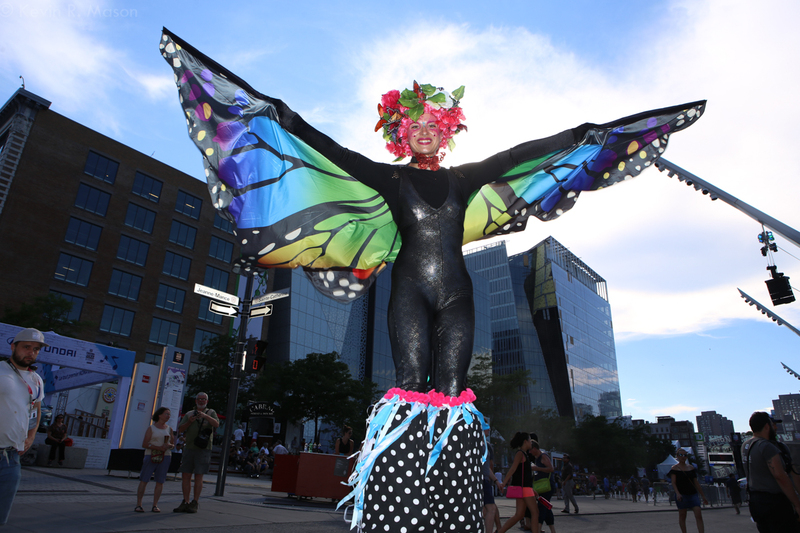 In partnership with the new Cultural Policy of the City of Montreal and new Tourism Montreal Development Strategy, the Festival will become a vehicle for all, promoting the discovery of our cultural and social wealth by anchoring itself in various neighbourhoods throughout the city. By continuing to occupy its central site in the Quartier des Spectacles with large-scale gatherings, indoor shows and family activities, this global Festival will meet the people thanks to the creation of new festival centres called Hubs. By reaching out to more communities and inviting Montréalers and tourists to visit less-familiar areas of the city, these “Hubs” will promote contact between citizens and generate new spin-offs for the boroughs, in a spirit of inclusion and integration. Starting in 2019, there will be a new “Hub” each year over the next 5 years, allowing new neighbourhoods to benefit from this extraordinary cultural, economic and touristic engine. These “Hubs” will reflect the boroughs and their communities, in liaison with community organizations, merchants and citizens. They will be free of charge and offer the same artistic quality as the Festival, respecting the principles of sustainable development and eco-responsibility. 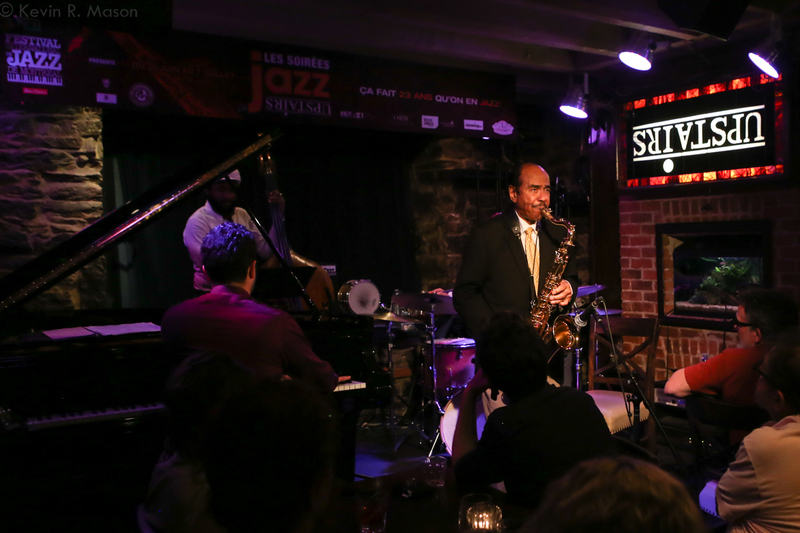 The 40th edition of the Festival International de Jazz de Montréal will be held from June 27 to July 7, 2019. For more information, go to: www.montrealjazzfest.com. «Next Post The 2018 Litchfield Jazz Festival – Coming Soon!